We often make grand gestures of how we deliver the very best dumpster rental experience and there are no competitors that compare to our customer service. If we’re gonna put ourselves on that pedestal, we better make sure our Dumpster Delivery Experts are up to the task! 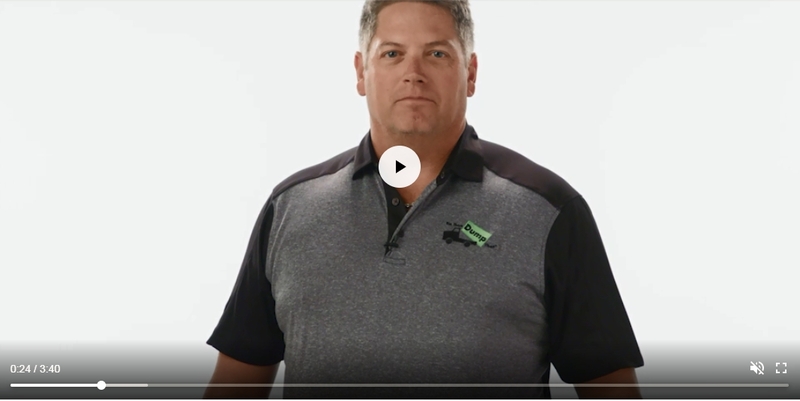 In this post, you’ll discover why our new Delivery Expert training videos for our franchises assures you will receive the best dumpster rental experience possible. The great thing about working at a franchise business is that you have the benefit of a strong, recognized brand behind you while still working for a locally owned and operated workplace. It’s an opportunity to be a big part of the community by offering customers a product or service they know they can count on. While Bin There Dump That locations are independently owned franchises, they still represent a well-known national brand. That means there are certain standards and expectations that need to be maintained to ensure the customers get the level of service they expect every time they rent a dumpster. One way to ensure that happens is by developing standardized training methods and that’s why we developed the Dumpster Delivery Expert training video series. Here’s a quick break down of what they’re about and how they can help create a great customer service experience at Bin There Dump That. In our introductory video, we explain what a franchise is and what it means to be a part of one. As we’ve already mentioned, each one is an individually owned business with the power of a nationally recognized brand behind it. The main take away from this video is that there are four keys to a franchise’s success. These are its clients or customers, the team members at each location, the employer or franchise owner, and the franchisor. Without satisfied customers, there wouldn’t be a Bin There Dump That franchise and each of the individual videos outlined below are designed to help ensure they walk away with the experience they are expecting. The first video addresses the importance of the daily circle check. The idea is to catch any potential issues with the truck you’re driving before they become a safety concern for you or the people sharing the road with you. It’s legally required and it’s morally the right thing to do. Bin There Dump That has a standardized circle check form that must be completed and kept in the truck’s binder every day. Keeping each franchise committed to safety and profitability is an important part of our corporate culture. Bin There Dump that vehicles use a hydraulic lift system to deliver and place each dumpster to our clients. This video shows how to properly operate the system and how to do it safely. Each Dumpster Delivery Expert has to learn how to operate the system safely and efficiently. This is also in keeping with Bin There Dump That’s commitment to creating a culture where safety is an essential part of what we do each and every day. While safety is important at Bin There Dump That, so is operating efficiently and profitability. One of the procedures we’ve developed to help us do this is something called nesting. That’s the focus of the next video in the series. It involves inserting smaller dumpsters inside larger ones. This allows each location to get the most out of available yard space and it means we can deliver more than one dumpster at a time when needed. As a Dumpster Delivery Expert, this is an important part of your job and in this video you learn how to perform this procedure safely. Our basic delivery training video is one of the most important ones in this series. Not only is it important for you as a Dumpster Delivery expert to learn how to deliver a dumpster safely, it’s essential that you do it courteously and professionally. You’re the face of the franchise and we want to leave a lasting and positive impression on each customer. Here you’ll learn how we do this and how you can contribute to growing the brand by creating a quality and enjoyable experience for the customer. Of course, a staple of our delivery process includes, laying down boards, assuring your driveway and property is ALWAYS protected. Once the customer’s finished with the dumpster as our Dumpster Delivery Expert, you’ll be the one picking it up as well. In this next video we explain how to properly tarp it and pick it up safely. Once again, you’ll have direct interaction with the customer and possibly other members of the public. We also express the need to maintain the customer’s positive experience with Bin There Dump That in this video as well. The last step in your job as a Dumpster Delivery Expert is emptying the dumpster at a landfill or transfer station. Each one has their own rules and safety guidelines and this video shows you how to comply with these rules and maintain a good working relationship with their employees who you’ll have frequent interactions with. All of these videos together are designed to help you be a successful Dumpster Delivery Expert and the positive face of our franchise! From delivery to pick up, a Bin There Dump That dumpster rental should be consistent from Fargo, North Dakota to New Orleans, Louisiana and everywhere in between; these training videos will help the franchise system maintain its level of consistent and top-notch customer service.